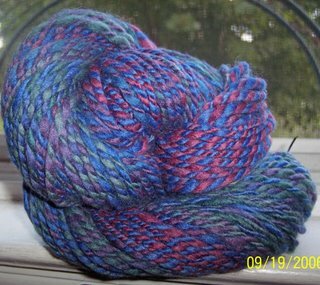 Here you can find my handspun yarn spun from high-quality fibers that have either been dyed by someone else, or hand-dyed and hand-painted by me. 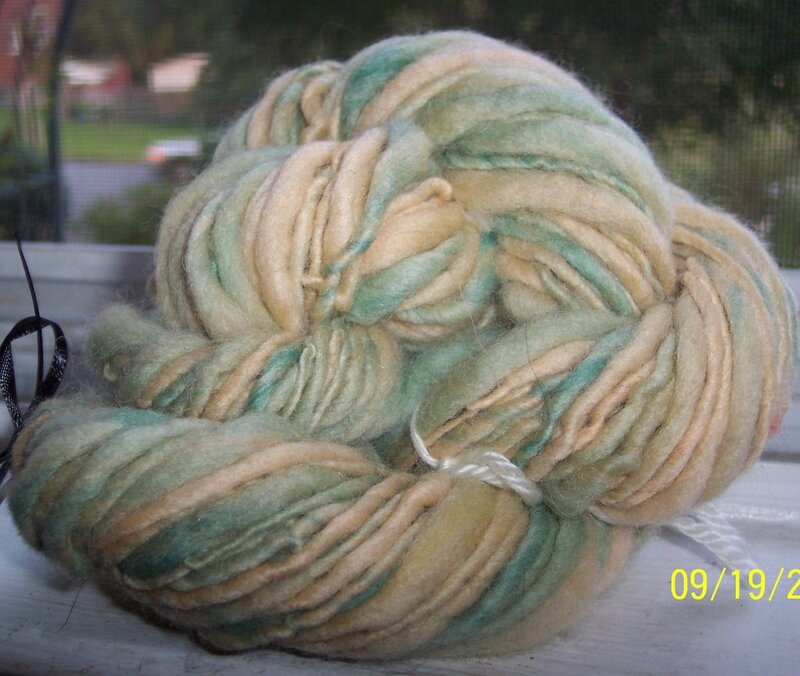 I will also eventually be selling my own hand-dyed and hand-painted fiber on this blog. If you have any questions please don't hesitate to email me. My preferred payment method is Paypal, but I also accept money orders and checks. 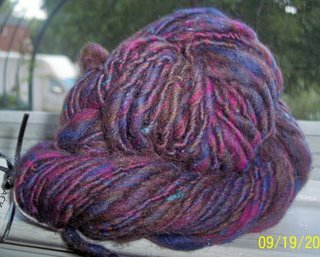 Shipping is included in the yarn/fiber price. If you're a local, my yarns can now be fondled and purchased in person at The Technicolor Sheep on Eagle Rd. in Havertown, PA! Laura is a great chickie, the shop is warm and inviting, and municipal parking is right behind the shop! and soon, My Bonnie and Clyde! And if you're in the area, my yarns will be at Craftland in Providence, RI from Dec. 1-23. Go here to read more about Craftland! Thanks SO much for your interest in my yarns! Your support keeps me spinnin'! Just a quick, photo-free post (I'm on my desktop and my photos are on my laptop, whose connection is being temperamental again) to let you all know that there is a yarn update at Yarn Rescue! Lynnell took great pics of my pretty yarns! Go buy! First of all, I just want to "publicly" thank Patrick from Wichita for his lovely email! Turns out Patrick has been buying my yarns through Lynnell, and wants to credit me for the yarns of mine he uses in his freeform crochet work! WOW! So wonderful to hear that people like my yarns and use them!! Thanks, Patrick! This is "Moody," 93 yards of supersoft Merino spun thick n' thin. 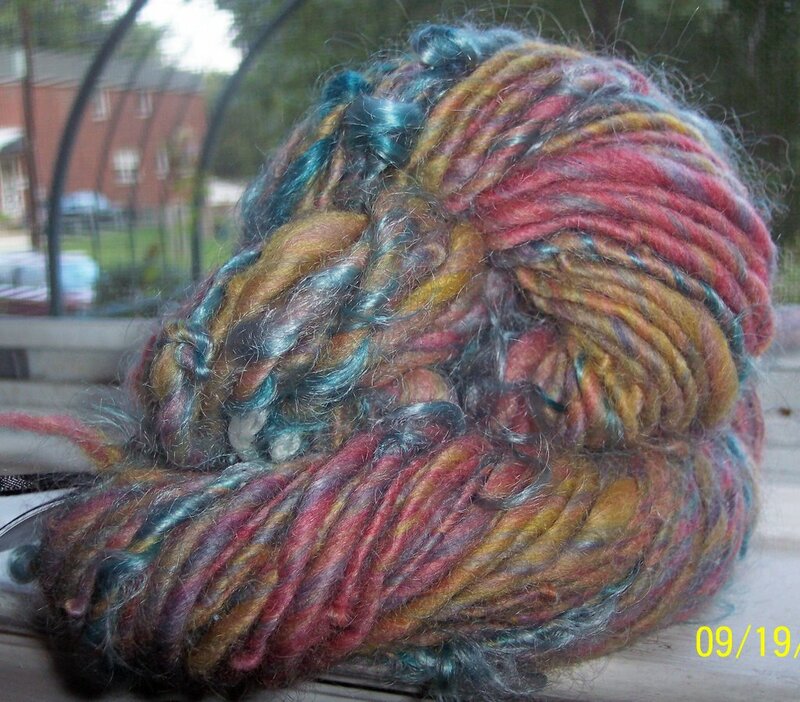 I purchased this roving through Handpainted Yarn. Nice stuff! It's a pretty blend of dark blues through to lighter blues. "Royalty," 132 yards of 2-ply gorgeousness! 70% Merino/30% silk, painted in gorgeous royal blues, berry purples, emerald greens. 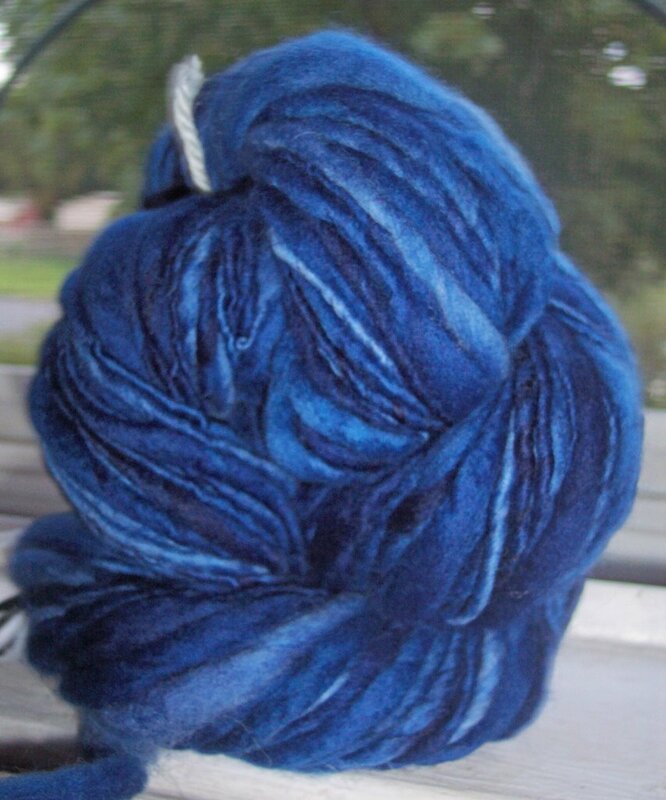 This is one GORGEOUS skein of yarn! 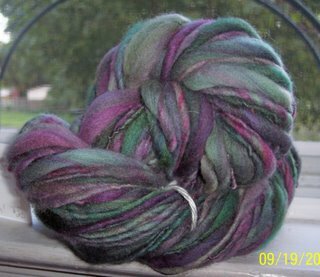 This is "Napa," 85 yards of Falklands hand-dyed by Sheilah, who is one of my favorite fiber artists to buy roving from. She has a real gift for color, deep purples and greens and everything in between - reminds me of grapevines in the sun. "Little Girl's Room," 86 yards of BFL hand-dyed by yours truly. 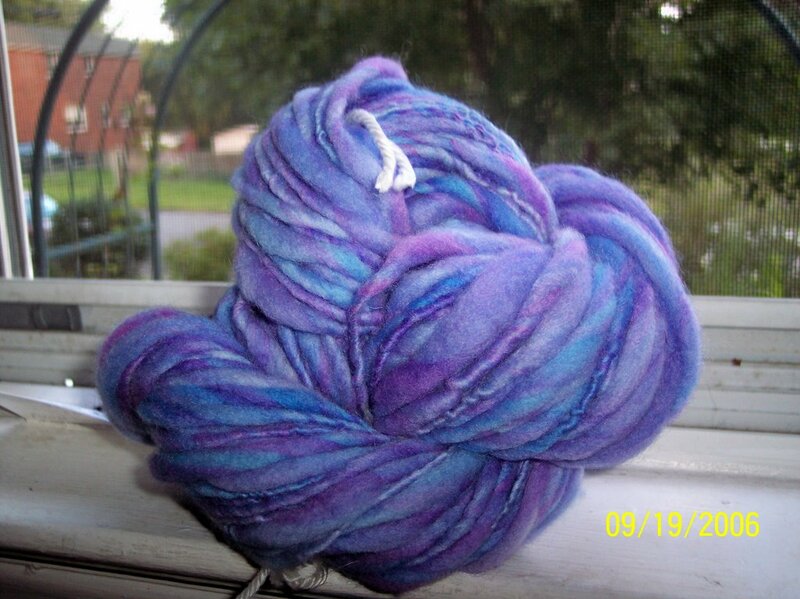 I LOVED spinning this fiber up, and the blend of colors from sky blue to lavenders to pinks is gorgeous! 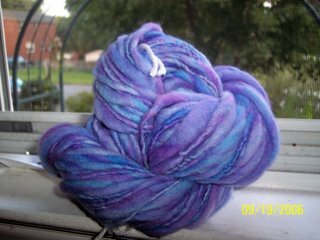 I think BFL is probably my favorite fiber, I've dyed some more up, so you'll be seeing more of it in my yarns! New yarns will be winging their way to Lynnell tomorrow. Here's a preview: "Boogie Nights" 77 yards of Romney that I spun from cute little rainbow batts, spun with light blue mohair locks. Not the softest yarn in the world because it's Romney, but a pretty yarn! 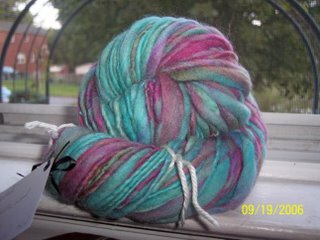 "Coastal", 91 yards of turquoise and pink yarn spun from fiber from Ashley. Soft and squishy domestic wool. "Bibbidy-bobbidy-boo", 55 yards of Merino in 4 different, very complementary colors, spun with soft and very springy bright pink mohair locks. I named it in honor of my daughter, who is now a huge Cinderella fan, and considered keeping it for myself! 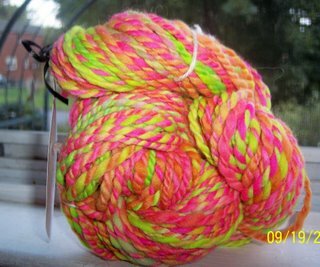 "I Go Day-glo", 70 yards of 2-ply eye-bleedingly bright squishiness spun from fiber from Amy. The name was suggested by my husband, supposedly the name of a Henry Rollins song (I'm more a fan of his spoken word than his music). Ah...where do the photos go when Blogger says they've loaded to your page, but you come back and they're nowhere to be found. I will be back to blog again! 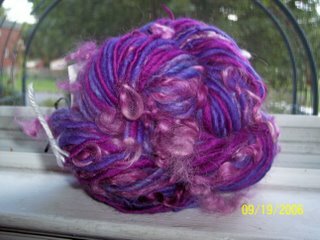 Oh, and my yarns at Purple Pink and Orange are on sale 10% off! And so are the yarns in my Etsy shop! Just a note to let you all know that my yarns are now up and ready for purchase with Yarn Rescue. Lynnell did a BEAUTIFUL job with pictures, they look so yummy! You go buy! Lynnell at YarnRescue, in addition to being practically moments away from delivering her first baby, is organizing consigners for her site. So I'm going to be consigning more yarn with Lynnell! Buy yarn from her, either mine or her own, she's a total sweetie and her yarns are gorgeous! I sent a package out to her today, so it should be up soon! Check it out! And if anyone is looking for yarns on MYMY!, the site is down for a re-design. I actually sold a skein of yarn there...and TWO at Neauveau...woo-hoo, someone's actually noticing my efforts! Enjoy! This is a Flickr badge showing public photos from talamorgan. Make your own badge here.